How to solve video memory management internal Error in window 10. 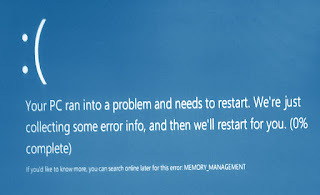 Home » fix » How To » Windows 10 » How to solve video memory management internal Error in window 10. In Microsoft windows OS there are several errors occurs related to video memory or in other words problems related to graphics problems. while playing latest games on windows pc this error will often pop up. There are no exact solution available over the internet. This blue screen error will seen mostly while exit or close the game. In my case when i close the game after playing windows crashes every time. There is no any technical reason to overcome this situation. So as suggested on Microsoft website i tried to understand the dump file but nothing has been noticeable. There might be following problems in your PC. Installed older or outdated Windows 10 insider preview. Older or Newly publish beta video drivers. Most probable reason might be corrupted or older version of graphics divers. Or some times newly released drivers also cause the problem, So either you Update your drivers with latest version or if already done then roll back to recent stable version of drivers. For Nvidia graphic card user it is highly recommended to use most stable version of drivers. This solution is not permanent but it may be give you temporary fix. Set your display resolution lower as possible as. For example If your resolution is full HD then before launch the game set your monitor resolution with HD 1366x768. Or Set your display resolution same as your game resolution. This will eliminate blue screen error while exit or close the game after playing. Thank you So much solution 2 is working!! That may be work for most of games. But in x64 based os some games not working in compatibility settings.